In this letter to Governor Schoeppel, E.E. 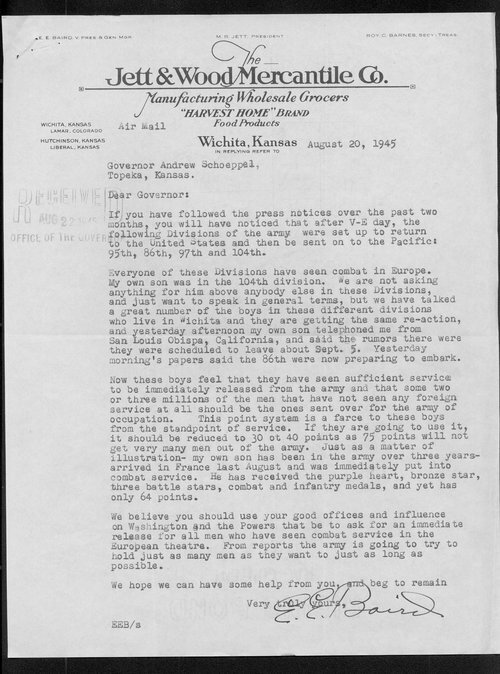 Baird of Wichita Kansas, asks the governor to use his "good offices and influence on Washington" to speed-up the return of Kansas soldiers who served in World War II. Like many Americans, Baird was anxious to have the troops home following the official end of World War II. However, as Schoeppel's reply indicates, immediate demobilization for all military members was impossible. This item demonstrates the American public desire to see their fighting men and women return home as quickly as possible following World War II. Therefore, this item can be used with other items on the home front during World War II to help students appreciate the war's toll on the people left behind.